Cardiff is quickly becoming a bastion of food and drink. We are being spoilt for choice with a new joint regularly oozing into the scene – whether you fancy a bib and seafood at Lobster and Burger, a sweet snack at Pancake House or a juicy burger at American favourite Five Guys – it seems we have it all. But we didn’t know what we were missing until a Slug and Lettuce popped up on the corner of Friary Centre offering some of the most delicious food around. Whatever your stomach growls for they have it. On a sunny Monday afternoon I strolled over to Slug and Lettuce. As I walked in the restaurant my favourite song Take Me to Church by Hozier was playing softly over the sound system, the swanky purple décor adorned with glittering chandeliers was looking fabulous, the sun was shining through the windows, and I was instantly greeted by an upbeat waiter. Good start I thought. The manager of the restaurant guided us over to our table positioned in the conservatory. We had a lovely view of the Castle and City Hall and it was the perfect place for people watching, an activity I think we can all admit to enjoying. We wasted no time ordering a couple of spritzers and delving in to reading the extensive menu. For mains, my friend and I decided we would share two dishes as we were finding it way too difficult to decide on just one. First, on our list was the Spanish-style Chicken with Quinoa and Couscous chosen off the under 500 calories menu. A light refreshing dish that tasted very much of the black beans. It was so tasty you would never have known about its low calorie rating. My friend and I summarised that it would be the perfect dish for those on a first date, it was easy to consume while still allowing you to remain dignified. 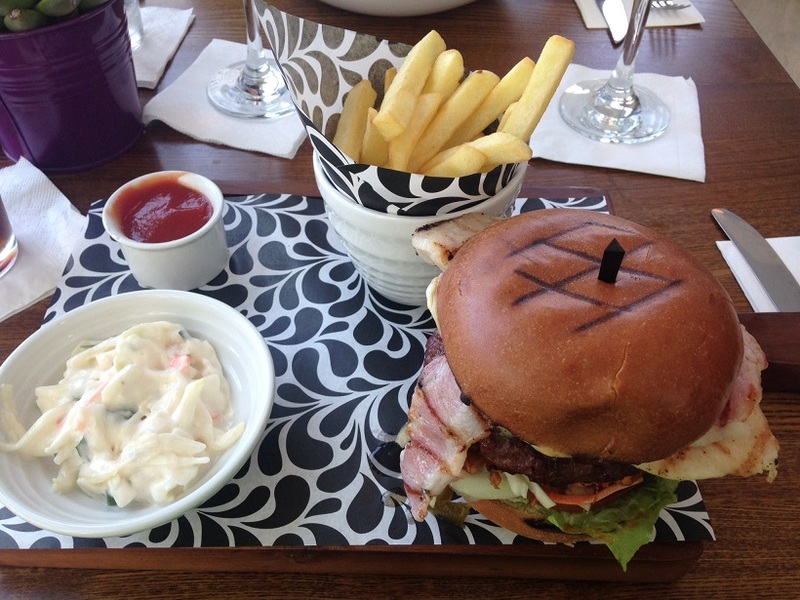 On the other hand there was our second choice The Ultimate S&L Burger. A meal that really requires your full attention. Fitting your mouth around the layers of cheese, juicy beef, crispy bacon, succulent pulled pork and salad dressing was a challenge but one that I was more than happy to accept. The dish came with chips and spicy coleslaw, and when served altogether it became an immensely satisfying meal. When our friendly waiter Dan asked us if we wanted desserts just a look between me and my friend was required and we knew it was on. On the waiter’s recommendation we went for the Cookie Cup Explosion off the specials menu and the Chocolate and Salted Caramel Bar. The cookie cup was a little hard to get into at first but when the ice-cream melted onto the hard exterior of the cookie it was divine. 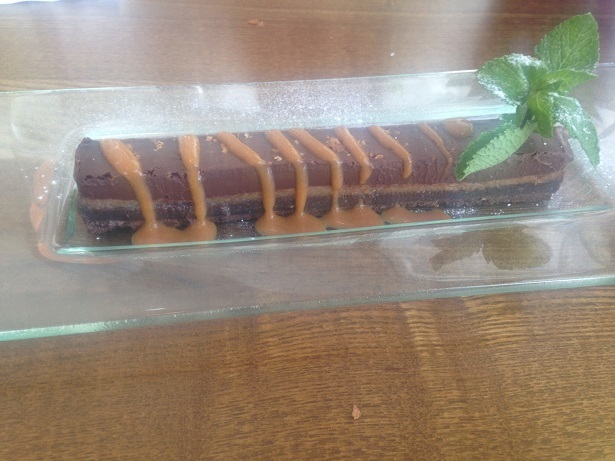 I cannot fault the latter choice – it was possibly the best dessert I’ve ever had! You just have to try it for yourselves. We could have shared further desserts, but this is more of a reflection on the deliciousness of the chocolate goodies than than the portion sizes. Everyone loves a bit of pub grub and if you don’t fancy eating your fish and chips while watching a bunch of students down their 2 for £10 pitchers at Spoons then Slug provides a very viable alternative, sprinkling a little class on the proceedings. If you fancy judging for yourself (and trying the chocolate and salted caramel bar) then head down on a Monday where you will get 50% off your total food bill. This way you can eat double as much – it’s just maths! Head over to the website now: http://www.slugandlettuce.co.uk/slug-cardiff/ to book your table and to look at all their other promotions and deals.